BIOSENSOR’S unique detection technology gets its strength from combining very high sensitivity and high selectivity. This means that by maintaining very high sensitivity, false positive alarms are kept very low. BIOSENS®300 is proven to deliver extraordinary performance in unclean environments. Another superior feature of the equipment is the short clean-out time. Any contamination will be cleaned and the system will be able to perform at its original capacity and sensitivity, within 10 minutes. Surveillance systems have become a reality even in the most safe and protected areas of our society. Yet there is still a concern. Explosive substances are not always detected by normal surveillance systems and detectors. High-security locations, such as nuclear power plants, airports and military bases, require the means to detect explosive substances in a reliable and functional way. A difficulty today screening for explosive substances is the high level of false alarms. Professional security personnel need a complete battery of equipment enabling them to fully detect liquids, traces and substances for analysis in the field. 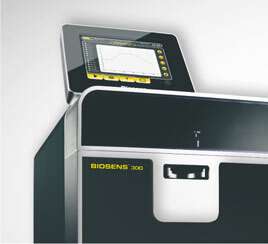 BIOSENS®300 screens for traces, performed with a quick and easy swipe sample, giving an immediate detection and identification of a threat substance. For example, samples can be taken from engine compartments, cargo, clothes, bags, steering wheels or any other object. Analysis and identification of substances takes only 30 seconds.